We’re currently working on a turn-based strategy game in Unity3d called Grim Legions. It’s a relatively simple game (much simpler than Crown of Conquest anyway), but still a lot of fun. 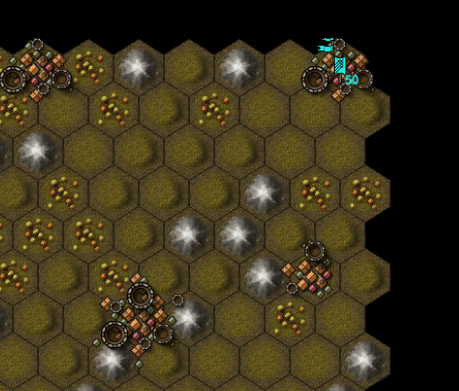 You get to control units that move around a hex-based map trying to capture towns. Each turn, the towns recruit more units. The aim of the game is simply to wipe out your enemy (destroy all their troops and capture all their towns). There can be up to 4 players (currently only 1 human player, but multi-player is planned), and you can make alliances with other players. There are three different types of troop: infantry, archers and cavalry. There’s not much difference between these types, archers are just better than infantry, and cavalry better than archers. Unlike a lot of other games, you can combine multiple troop types in one unit (or “legion”), and you can split and merge them as much as you like. One of the features we’re really happy with is the map generation. It is randomized, but you have a lot of control over it. E.g. if you get sick of your units taking ages to move through the mountains, you can just generate a map without mountains. You can also decide how much of the map you want to be water (which no troops can move through), from 0% to 60%. 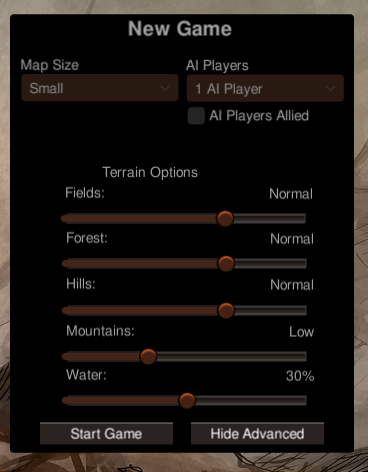 There are also 3 map sizes to choose from. This means – despite the relatively simple gameplay – there are quite a few different scenarios. You can end up spending a lot more time playing this game than you think! We’re about 60-70% done, so should be ready to release in the next few weeks. It’ll be available for Windows, Linux, and WebGL (Mac release will be possible too if people are interested).